Why Is Iran Testing Ballistic Missiles After the Nuclear Deal? Iran has promised that its nuclear program is purely for peaceful purposes, but it has continued to test nuclear-capable missiles. How the international community responds will be crucial. New evidence of Iran’s confrontational behavior emerged earlier this summer when it came out that its Islamic Revolutionary Guard Corps (IRGC) conducted another series of ballistic missile tests in late April. This was the eighth such test since the Joint Comprehensive Plan of Action (JCPOA), the formal name of the nuclear agreement, went into effect in July 2015. 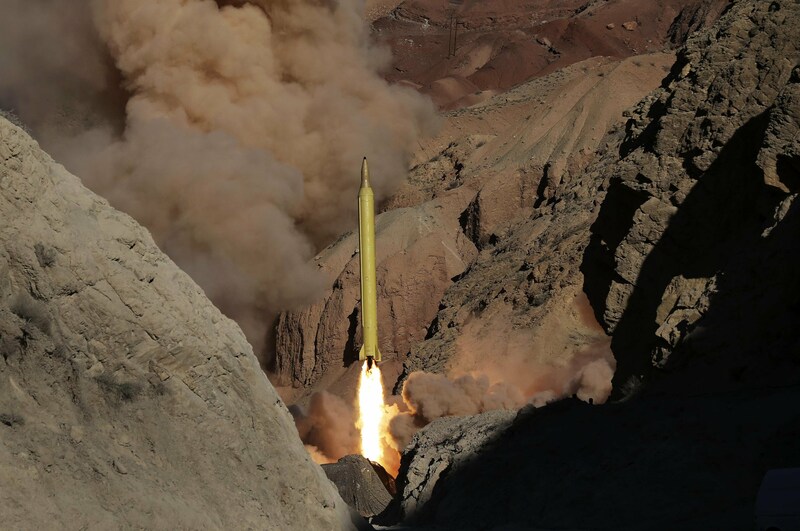 According to Iran’s Tasnim news agency, Iran test-launched a missile with a range of about 2,000 kilometers and said to be accurate to within eight meters; enough to reach Israel and any other country in the area. As White House spokesman Josh Earnest continued to maintain that the government was “still trying to get to the bottom of what exactly transpired” rather than condemn the act, Iran’s defense minister rushed to deny that such a long range missile was even tested, though he did stress that Iran was constantly working to build its defensive capabilities, including its missile arsenal. Iran also made clear that the missiles being tested were conventional, and not designed for nuclear warheads, as some in the U.S., Europe, and Israel warned. “Iran’s missile and defense capabilities are not open to negotiation,” Iranian Foreign Minister Mohammad Javad Zarif stressed. Is Iran breaking the terms of the deal? Why is Iran testing missiles? And how should the U.S. and the international community respond? Vice President Joe Biden, who happened to be in Israel at the time, reiterated to the press and to Israel that the U.S. would act, as promised, if Iran broke the terms of the nuclear deal. In October and November, only a few months after the approval of the nuclear agreement, Iran tested long-range missiles, which the U.S. then called “inconsistent with [United Nations Security Council Resolution] 2231,” which was passed by the Security Council to codify the deal. The Treasury Department enacted sanctions designations on Iranian entities involved in the missile program the following January. The Obama administration similarly designated two Iranian entities involved in missile production following the March tests, while France’s foreign minister said that the European Union might enact sanctions of its own. But while these recent tests were provocative and drew the ire and concern of much of the world, the White House was careful not to declare these an outright violation the agreement. The Russians were similarly quick to point out that the new UN language only “called on” Iran to cease ballistic missile activity, but did not demand it. Iran, meanwhile, remained steadfast in its position that its missile activity was not covered by the nuclear agreement, and would continue as part of its legitimate defense policy. Following these confusing developments, a few key questions arise: Is Iran breaking the terms of the deal? Why is Iran testing missiles? And how should the U.S. and the international community respond? Does Iran’s missile testing violate the nuclear agreement? The short answer is no. Sort of. Depending on who you ask. Until the passing of Resolution 2231, any activity related to the development or testing of ballistic missiles by Iran was strictly prohibited by a series of Security Council resolutions going back to 2006. Those resolutions also targeted dozens of entities that make up Iran’s missile industry, a sprawling organizational web under Iran’s home-grown arms industry and its Ministry of Defense and Armed Forces Logistics. The U.S., EU and other key allies continued and built off these resolutions to extend the list of Iranian entities with whom American and European entities could not conduct transactions. In the U.S.’s case, this included foreign financial entities and traders of key technologies and components that Iran cannot produce on its own. All this did much to slow down Iran’s missile development. The logic was that a nuclear weapon requires three components: enriched fissile material (uranium in Iran’s case), a delivery vehicle (usually some sort of missile—whether fired from land, sea, or air), and a warhead that integrates the two. Therefore, sanctioning ballistic missile-related activity fit logically into the sanctions meant to limit or at least punish Iran’s illegal nuclear activity. So a last-minute compromise was reached. Missile-related sanctions would remain in place for an additional eight years, with the military embargo extended for five more. This seemed necessary to close the deal. The confusing part is that the JCPOA agreement itself does not deal with non-nuclear issues like ballistic missiles, but Resolution 2231, which replaced the previous Security Council resolutions on Iran, does. And the wording of the resolution is critical to this issue. Paragraph 3 of annex B states that Iran is “called upon not to undertake any activity related to ballistic missiles designed to be capable of delivering nuclear weapons, including launches using such ballistic missile technology.” The problem is that this is legally nonbinding language, and essentially means that there is no longer a legal prohibition regarding missile testing. Rather, missile testing is now, as University of Alabama School of Law professor Dan Joyner described, merely “not in harmony” with the spirit of the resolution. Moreover, the resolution is purposefully ambiguous as to which launches are “capable of delivering nuclear weapons.” Without getting into the details of rocket science, this becomes essentially a “he-said, she-said” argument, similarly making UN action unlikely. So if the missile testing is examined from a dry and legalistic reading, then it seems Iran violated the “spirit” of the deal but not its letter. And this is why the few sanctions that followed the earlier tests were unilateral American ones, and limited at that. Few countries are as puzzling for the outside observer as the Islamic Republic of Iran. And that is for two reasons. First, unlike your average dictatorship, Iran is far less centralized than most think. The Supreme Leader has the final say on important matters, and the religious and unelected elites vet possible candidates for elected positions. But there are numerous centers of power fighting for influence within and between the massive and confusing government, military, and religious decision-making bodies—sometimes in coordination, and sometimes in conflict. And on top of all that, there is currently an ideological struggle taking place, between the ultra-conservatives hostile to the agreement and anything that smacks of a retreat from the Islamic revolution, and the more pragmatic camp led by President Hassan Rouhani. He was voted into office by a largely moderate population desperate to rid the country of sanctions and end the international isolation. The IRGC belongs to that former group, which gains influence and power from a constant state of tension with America and the West. The IRGC also has a great deal of control over the state-run and semi-state economies, especially dominating the energy, construction, and manufacturing sectors. If taken in this light, the missile tests, and the bellicose messages, seem to be as much for domestic political consumption as anything else. After all, the IRGC is also the organization that controls Iran’s missiles. Many in this camp would be happy seeing the agreement ditched entirely. 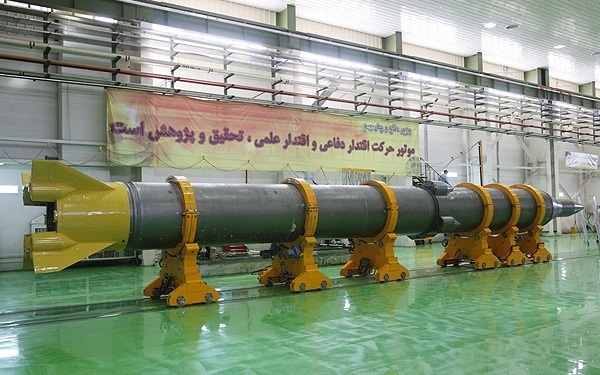 And if Iranian media reports are correct that Rouhani asked the Supreme Leader to order the removal of the Hebrew writing on the missiles, then viewing these tests within the prism of a power struggle in Iran makes all the more sense. Rouhani, after all, is well aware of the pro-Israel influences in the U.S. and EU, and the negative effects of such provocative behavior. There is another factor that is probably far less interesting but no less important to understand: Ballistic missiles are an essential part of Iran’s defense strategy and posture. Iran once possessed a large and modern American-built military. When relations with the U.S. ended in 1979 after the Islamic Revolution, the U.S. imposed an arms (and trade) embargo that prevented Iran from upgrading its air force. The missile tests aren’t done solely for public consumption—they also form an essential part of Iran’s military strategy. Lacking the resources and access to spare parts, technology and hardware, Iran turned to a Soviet-style military strategy to project force far from its borders: missiles. This need became glaringly relevant during the Iran-Iraq War (1980 – 1988). During the “War of Cities” in 1988, Iraq relentlessly bombed Tehran with Scud missiles, leaving Iran vulnerable and helpless as much of Tehran’s civilians fled the city, prompting Khomeini to end the war. One of Iran’s key lessons was that absent a large air force capable of projecting power beyond Iran’s borders, a missile strategy would be the key to its defense. While originally developed with Israeli support (pre-revolution), Iran set off to develop its arms industries throughout the 1990’s and beyond, with Soviet (later Russian), Chinese and most importantly, North Korean support. Thus, while Iran’s missiles are viewed in the West primarily as a vehicle for nuclear weapons, for Iran they also serve a crucial aspect of its conventional military strategy. And this isn’t expected to change so long as it lacks a serious air force for years to come. If its arsenal improves in accuracy and dependability, as is believed to the be Iran’s goal, Iran may never need to turn to the far more expensive option of acquiring and maintaining an advanced air force, as have Iran’s Gulf rivals and Israel. And while Iran currently lacks accuracy on most of these, it is working to improve this constantly. Its large and growing arsenal could serve it in a saturation strategy, which it would use to overwhelm enemy missile defenses, such as the Arrow in Israel or the THAAD in the Gulf. Understanding the importance of ballistic missiles in Iran’s defense strategy is thus crucial to understanding why getting Iran to stop testing missiles will be a difficult task. Many observers have lumped Iran’s recent purchase and acquisition of the S-300 air defense system from Russia as a sign of Iran’s growing aggression, as well as the Obama administration’s continued indecisiveness to ensure that Iran upholds its end of the agreement. The S-300 is considered one of the most advanced air defense systems in the world. It would seriously upgrade Iran’s air defense capabilities and thus afford it additional confidence. Iran and Russia originally began negotiating the agreement in 2007, before Russia was pressured by the U.S., Israel, and others to halt the sale. Military sources in Israel and the U.S. were concerned that Iran operating the system at its nuclear installations would make the mullahs more brazen and a pre-emptive military strike more challenging to stage. However, because the S-300 is technically a defensive capability, it was never explicitly forbidden by the UN, which only prohibited the sale of offensive weapons platforms to Iran. This is another example of what was permissible under the letter but not the spirit of the previous UN sanctions on Iran. And with the JCPOA agreement in place, Russia and Iran could go ahead with the deal. Given that missiles are Iran’s last resort for maintaining a strategic defense posture, and offer it the only ability to project power, it is unlikely to give them up. While Iran will continue developing its missiles, it is expected to remain cautious and ambiguous, hiding its true capabilities, announcing and then backtracking on key developments, or making wildly threatening statements and then denying them. This can be chalked up to Iran balancing its need to maintain deterrence against Israel, Saudi Arabia, and the U.S. with its need to prevent additional sanctions or a preemptive strike. This could also be an indicator of the ideological power struggle being waged inside the Islamic Republic. In either case, Iran will likely remain cautious not to develop missiles that could reach deep into Europe, let alone to the U.S. Besides, Iran is still at least a decade away from being able to reach those distances. That development would almost certainly force the U.S. and EU to respond with harsher measures. So long as Iran’s missile activity is relegated to threatening regional rivals, it is doubtful the international community will do much more than issue vague warnings, certainly in Obama’s remaining months. If Hillary Clinton wins the upcoming election, she would be expected to continue the cautious strategy regarding Iran, while it’s not at all clear what a president Trump would do against such provocations. At the same time, nothing in Iran’s behavior thus far suggests it will cease or even slow down its arms transfers, including missiles and rockets, to its proxies in the region – including Hezbollah, Hamas, Palestinian Islamic Jihad and others. If anything, the nuclear agreement only emboldens Iran to continue and increase this activity as well. There are a number of key points for American policy makers to consider. The first is that Iran may be testing missiles for domestic political reasons, strategic posturing or to advance its own conventional military capabilities. But none of these negate each other, or the long-term dangers of an advanced Iranian missile program. In 15 years’ time, after the JCPOA restrictions relax, Iran will return to a breakout period measured in weeks or days. After all, the American strategy in regards to Iran rests essentially on pushing Iran’s path to a nuclear weapon 15 years away. The hope is that this new engagement will strengthen moderates and initiate a fundamental change in Iran’s character so that it no longer presents a threat to the international community. However, if Iran is allowed to continue developing its ballistic missile capabilities, then should that gamble fail and Iran remains fundamentally radical and aggressive, it will present all the more of a threat. The U.S. should keep in mind that the nuclear arrangement and lifting of sanctions is crucial for Iranian interests, and so it won’t walk away from the deal so quickly. Washington and its allies in London, Paris, Berlin, and Jerusalem must maintain pressure on Tehran, signal they won’t accept violations, all the while dealing cautiously with cheap provocations that may be more for a domestic than foreign audience. A look at Iranian missile launches since 2001, showing years with little or no activity during times of advanced negotiations, proves that when faced with an American threat, Iran knows how to restrain itself. In the meantime, the U.S., EU, and UN should continue pressing Iran on its missiles and regional behavior. The JCPOA should be viewed as a starting and not an ending point. The U.S. should not shy away from initiating negotiations, and if needed, push additional sanctions on Iran’s non-nuclear activities that harm American interests and regional stability. Given their centrality in Iran’s defense strategy, placing limitations on the range of Iran’s missiles might be a good starting point. Simultaneously, the U.S. should continue to strengthen its alliances in the region—both its broader missile defense architecture, as well as ensuring that its regional allies are properly equipped to deter—and if need be take on—Iranian aggression. Iran is content with supplying and orchestrating proxy wars against the U.S., Israel, and the Saudi-led camp of Sunnis. Therefore, the U.S. should also continue backing its allies in this ongoing proxy war with Iran—with arms, intelligence, and diplomatic support. Most importantly, the United States must keep an eye on the horizon and develop a coherent strategy for clarifying the expectation that Iran not only live up to the letter of the JCPOA, but also the spirit. The JCPOA was meant to deny Iran a path to nuclear weapons. But the spirt of the deal should also deny Iran the path to developing nuclear-capable ballistic missiles. The agreement to push Iran’s nuclear program back 15 years inadvertently freed Iran to advance its missile program and increase its support of regional radical groups. The U.S.’ regional allies are worried just as much from this as they are from Iran’s nuclear program. Failing to forbid Iran from developing nuclear-capable missiles was perhaps inadvertent and certainly ironic, but it’s not inevitable.